Mix the green and red bell pepper with chopped onions, corn, black beans and chopped chili peppers. Oil a skillet, heat it and place one of the tortillas inside. Heat it for one minute, then turn it upside down and heat it one more minute. Repeat with the second tortilla. Spread half of the cheese amount evenly over the surface of the tortilla, top it with the mix of corn, black beans, onion, red and green bell peppers and chili peppers, then spread the other half of cheese on top. Cover with the second tortilla. Let it heat for about two minutes or until you start smelling the cheese melting. 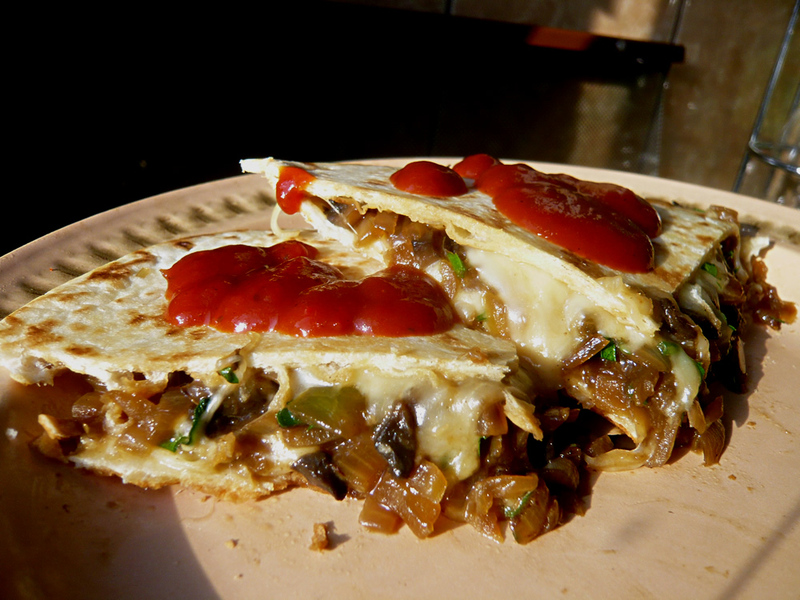 Flip over the quesadilla and heat it for 2 minutes more. Transfer it onto a chopping board and cut it into 8 wedges.